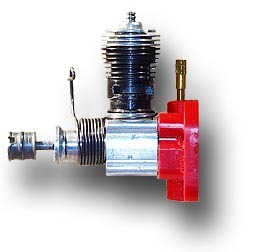 This is a product engine as it was used in the Pitts Little Stinker ready to fly model airplane. It was mounted in the model with the red plastic back plate. The cylinder pointed to the right of the plane. My engine came with a left hand starter spring and a matching propeller. 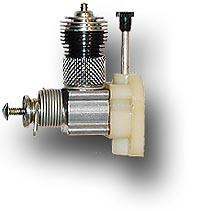 The needle stem is made from brass. The Skycopter was modeled after the Bell 47G helicopter. It came with a yellow framework fuselage and a clear canopy. As with all Cox free flight helicopters the engine was mounted on top of the rotor. 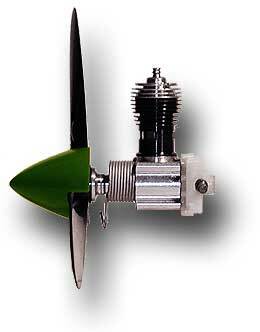 A large portion of the thrust came from the propeller attached to the engine, while the large rotor provided the remaining thrust. The well know system of weights attached below the plane of rotation caused the hinged rotor blades to adjust a positive angle of attack when the rotor r.p.m. was high. 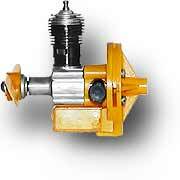 When the engine quit, the rotor r.p.m. dropped and the weights adjusted the blades to a slightly negative angle of incidence, causing transition into the autorotation mode. The engine was equipped with fuel tanks in metal, yellow, gray and clear transparent plastic material. The needle of this particular engine has a finer thread than usual. This Bee from the #190 engine series was used to power a control line model, namely the green Junkers Ju-87 Stuka. It is similar to the Two-Ninety replacement engine which is shown further down below. It came with a three bladed prop and a green spinner. The white postage stamp Delrin back plate slid into matching notches of the fuselage. The Stuka was known for its poor stability and control characteristics, so it is no surprise that this engine is almost new while the Stuka itself has not survived the hazards of control line flight. This engine was also used in the Ju-87 Stuka, but in the later, black model which featured a yellow spinner. I have rotated the back plate by 90 degrees. I got this engine with an exhaust deflector, which was not used on the older engine shown above. This engine was used in the Miss America Mustangs. 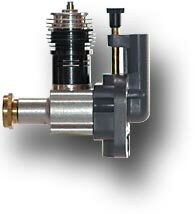 The spring moved the exhaust throttle back into the low speed position, so that it could be operated by a pure ”pull“ action. Later the throttle system was replaced by the ”flip-of-your-wrist“ throttle system shown below on the #190-6 engine. Engines like this were used in a large number of control line models. 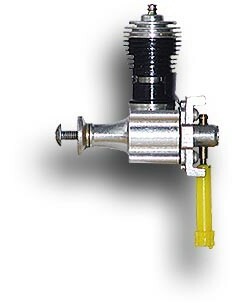 Often small modifications like the exhaust ”flip-of-your-wrist“ throttle were used to adapt the engine to the model. 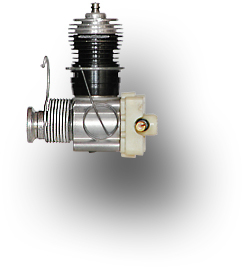 The black oxide steel spring keeps the throttle in its position as long as the pilot does not change gear. This particular model was used in a nice Combat Mustang P-51D. 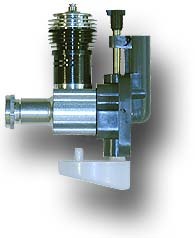 This is a typical sample of a product engine with the "horseshoe" back plate. This particular model was used in the trainer PT-19 with a left turning propeller and spring starter. I am still missing a matching rubber spinner for this engine. This engine has been used in another PT-19 trainer. 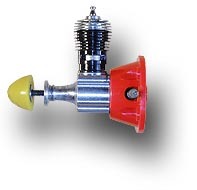 An interesting detail of this model has been the adjustable down thrust angle of the engine ranging from a "beginner" to the "expert" setting. This Super Bee engine was used in the Curtiss P-40 Warhawk and came with a cylinder having 2 transfer ports. It still used the classical cast metal back plate and not the later delrin plate. This engine was equipped with a mesh exhaust screen to prevent painful burns. 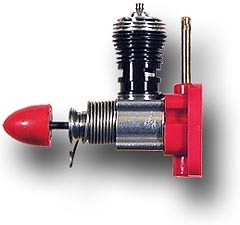 This was the first solution for people complaining about burning their fingers when priming with too much fuel might have caused a small fireball when they applied power to the glow plug. Another (and maybe more important) effect of the wire screen was to limit power and thus speed, facilitating to fly the C/L models. A small and heavy plastic C/L model with a .049 running at full speed can fly quite fast and is thus difficult to control for the beginner. This particular engine has probably been used in a PT-19 trainer airplane. As the mesh screen was difficult to manufacture and to attach to the cylinder, this engine was equipped with a slotted exhaust screen. The final, cost effective solution to limit power was the double slotted cylinder. This engine has been used in the F-15 Eagle and Falcon airplanes. The screen was spot welded to the cylinder. This blister packaged engine was intended to be a universal replacement for various control line models. It was also offered with a horizontally oriented backplate. This engine was designed for the Spook model and it is unique in that it came with a cast aluminum back plate. 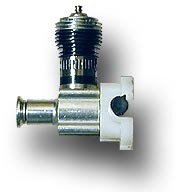 The brass needle valve was extended with a long yellow plastic part. It was also intended to be used as a replacement engine for other models like the helldiver, Stuka, Grasshopper etc. The Spook model was an unswept plank type flying wing stunt model which came as a "kit". All parts were molded from plastic, which was rather different from the typical balsa and spruce kits of the 1960s. The Ranger V was used as a product engine for many R/C models distributed by Cox. These models were usually made in China from Styrofoam and came almost ready to fly with these engines. The engines themselves were made in the USA. This Ranger V product engine was intended to be a replacement for the "Typhoon" R/C model. It came in a cardboard box with spinner, stub screw and two of the black oxide Cox tools. 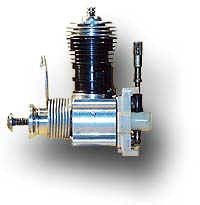 It is similar to the Dragonfly engine which was sold as a hobby engine. This engine was the last development for control line and free flight models. While some of these models were manufactured in China the engines always came from the USA. This engine has a new back plate with a snorkel type inlet, which makes priming easier. 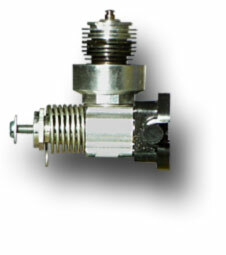 Also the needle runs through an additional eye so that vibrations and the possibility to damage the threads are reduced. The sample with the typical helicopter fuel tank comes from a «Nomad gravity resistant flying machine» similar to the earlier flying saucer style models. These engines were quipped with a muffler and used in the Aerobat and Firebird control line models. 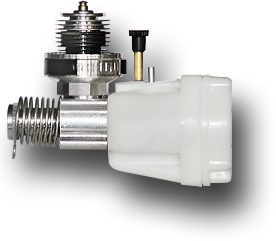 The needle valve points to the left and the muffler has a rather small hole, limiting power output for these small models.. The propeller was left handed. This particular model was used in The Cessna Aerobat 150 with the "Ez-Flyer" system. This engine has a brass propeller drive plate, otherwise it is identical with the engine above. 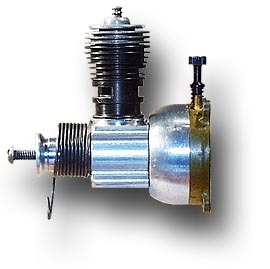 The engine was intended to be used in pusher configuration and the brass drive plate avoided excessive wear of the crankcase and drive washer surfaces. This engine type was for example used in the ”Backdraft“ C/L model (1997). 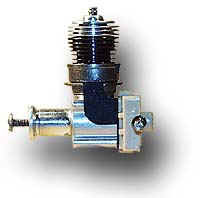 Cox later sold these engines in 2005 at a low price in a bulk pack, together with a plastic washer fitting the hex drive plate and a matching spring starter.